Blue is the new noir, and nobody does Blues like Chicago. This collection of dark stories, from today's best Chicago crime fiction authors, captures the depths to which people sink when they run out of options. The emptiness and pain spawned by greed. The violence—or occasionally, the bittersweet redemption—that springs from a broken heart. 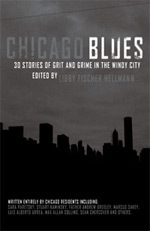 "Twenty-one excellent reasons to stay out of the Windy City..."
"Extraordinary... Chicago Blues is a splendid bedside book, to be enjoyed for a long time." "Classy... This impressive volume has soul, grit and plenty of high notes..."
"A strong sense of place, layered characters, and evocative prose..."
"Gritty, excellent... has my highest recommendation!" "An impressive group of stories... an amazing group of authors..."
"A solid anthology of crime stories... the batting average of Chicago Blues is definitely higher than most. Stand-out contributions from Hellmann, Stuart Kaminsky, Jack Fredrickson, David J. Walker, Michael Allen Dymmoch and Barbara D'Amato in particular recommend it."